Why would a commercial deer farmer, who raises giant trophy deer, poach wild deer? There are several reasons why people poach deer but seems rather odd for a breeder to do such a thing. Just doesn’t make sense. I inspected a certain wildlife breeder’s commercial license paperwork annually before signing off that I approve his renewal to do business raising and selling domestic whitetails in my area. He was a likeable businessman and was pretty straight, or so it seemed at the time. Over the years, the annual inspection of his facilities and records was a renewal ritual, a routine that had afforded us the opportunity to become more than just acquaintances; we were beginning to become friends. As I stated before, he seemed like a straight shooter, had a nice family … was just an all-around good guy. Then one day, in came the call. A trusted source (let’s call him Frank) happened to notice a group of guys he knew to be hunters, gathered around a pickup truck. One of them was the deer farmer (let’s call him Ken). It was during bow season, so he sauntered over to have a peek for himself. Expecting to see a nice antlered deer, along with hearing an exciting bowhunting tale, Frank became somewhat suspicious when the chuckling group got suddenly quiet. The deer was a big 10-point that didn’t disappoint as it lay dead of an apparent arrow wound. Frank, the caller, remained casual while asking, "Nice buck, a bow kill?" Ken, the deer farmer, leaned over the big-bodied buck and pointed to the arrow hole. "Yep, right there,” he replied, followed by some awkward smirking noises from the others. That wasn't much to go on, but the scenario did paint a picture of some possible wrongdoing. After I received all the information from Frank, I gave Ken a call. I told him I heard that he'd killed a nice buck and that I'd like to see it. Ken graciously acknowledged his harvest and explained that I could see the rack and a picture; the deer was already checked in, meat was in the freezer, and the cape was at the taxidermist. Wow, this guy moves fast, I thought to myself. But after all, he was one of those very organized businessmen. "I still have the arrow I shot him with," Ken added, "if you want to see that." So, I eventually met up with Ken, looked at the rack, a picture and the arrow. Everything seemed on the “up and up,” except for one thing. Ken had overlooked a simple regulation pertaining to broadhead requirements, and the blood on this “illegal arrow” was solid probable cause to dig deeper. I told Ken there had been an allegation reported, and I was going to have to hang onto the arrow for a bit but should get it back. He openly provided the taxidermist’s phone number. He even asked me, "Do you want me to go get it (the cape) for you? I can; I don't mind." "Nah," I replied. "Not that big a deal. I'll give him a call and go by when it's convenient." A little later I got in touch with the taxidermist by phone and he was helpful as well. He explained how the cape was all “froze up in a ball” and that if I wanted to look it over, he could take it out to thaw for a day before my estimated arrival, so it would be pliable for my examination. I was teaching a hunter safety course the next day so the plan was he would take it out of the freezer, while I was teaching, and I would come by the following day. Then it happened, “another break in the case,” as the saying goes. I had just ended my call with the taxidermist when suddenly, my phone rang. Caller ID indicated it was the taxidermist calling me back. I answered with a, "Yesss?" The taxidermist began talking to me really fast. He began by calling me "Ken" and allowing me only enough time to grunt out a, "Yeah?" "I just spoke to the game warden a minute ago and he's coming by to look at your cape. But don't worry, I'll have your bullet hole cut out before he gets here," the taxidermist exclaimed. About as quickly as it started, the taxidermist ended the call. After only a few seconds, he was calling me back again. This time he was really upset. He began talking fast again, explaining and defending his error in calling me by mistake and his use of the term "bullet hole." I'd heard bowhunters use the term loosely to describe their arrow entrance too, but this was bad timing for sure. He urgently declared that he wanted out of this whole mess immediately." He demanded that I come to his shop "right this minute" and take possession of the frozen evidence. He was an hour away and after numerous tries to explain about my schedule, his ultimatum was, "You come get it now, or don't come at all!" Thirty-six hours later, as promised, I called to tell him I was at his gate and wanted to pick up the cape. "If you want it, you'll have to get it from Ken. It's his property and he's the ONLY person I'll give it to,” explained the taxidermist. At that point, I called Ken and explained the dilemma. He called and tried to reason with the taxidermist too, directing him to give over the evidence. But the man would not relent, even after making him aware that he was committing the crime of “obstruction,” which was a $500 minimum fine. I eventually got the cape and antlers from Ken, and it substantiated all my suspicions. 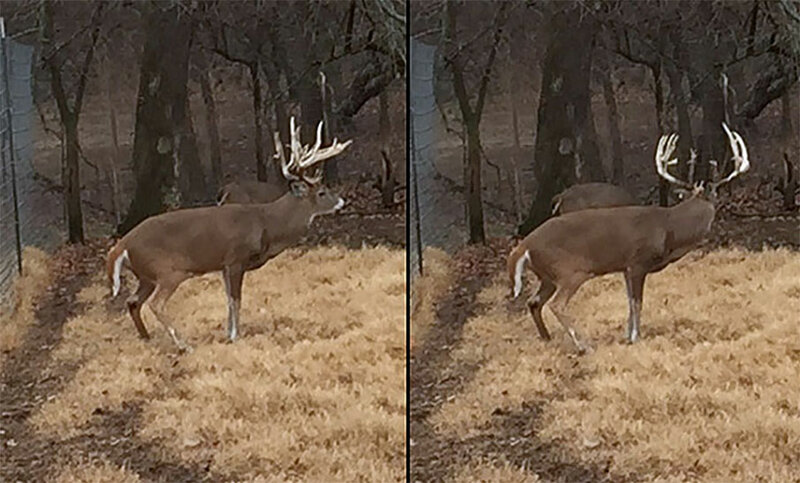 During the rut, several trophy bucks had repeatedly visited his deer pens and were “disturbing the peace.” So, he set up a deer stand on his wooded fence line area and waited with a bow for numerous mornings and evenings. But, like many of us, his sits were never synced up with deer visits. Then, late one night, he was stirred from the house by a lot of noise and commotion at the wooded fence line. Ken’s monster brood buck was at war, through the fence, with a big, free-range buck. He'd grabbed his rifle, flipped on a spotlight and dropped the intruder with one shot. Ken knew he'd done wrong and readily admitted it. I was fair, only filing half of the possible charges he could have received. Ken paid over $2,000 for his little indiscretion and even issued a second check on behalf of the taxidermist’s charge for obstruction. And I knew this man knew his deer antlers.